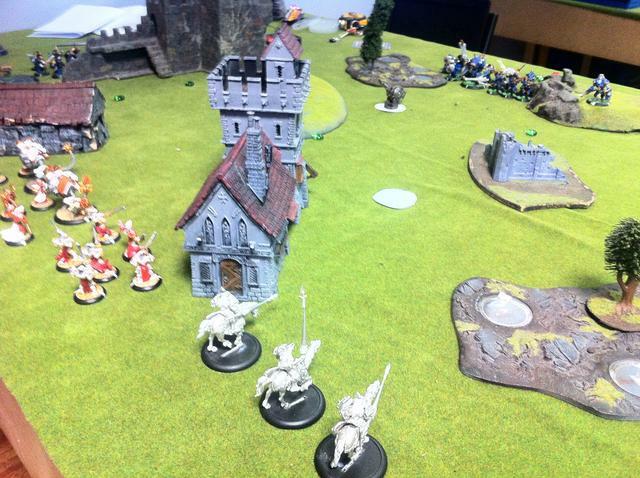 Warpcon 2014 – Game four. After 3 rounds and the end of Day 1 the Cork lads head down to a watering hole or two to discuss their games and drink away sorrows. Most of the time is spent giving Pat abuse, making him recount his loss every time a new person turns up and says “Pat?!? You LOST A GAME?!”. Take it as a compliment! I have an Appletini, the Champion’s Tipple of Choice, and resolve to drink lightly so I’m on form for the next day. One Appletini, 5 Vodkas and a tower of Cocktails later I’m at home having nightmares about Cryx and Trolls. So much for a light evening. I blame Pat. I’m picked up by my Driver and we head over to the tournament, grabbing a coffee and a baguette full of meat before Day 2 and Round 4 kicks off. Hello dear reader! My introduction this week comes with ill tidings as I have been struck down in my prime with the dreaded Con Lurgy! Don’t weep for me friends for I go to a better place! A place of sitting on the couch reading what stupid people have to say on the internet for hours at a time. A place where I can engage in an argument on the internet and win in as much a way as anyone can win an argument on the internet. Which is to say that I have lost but even more than that I am lost. Lost in the waves of misinterpreting what people said and petty insults. With any luck and a healthy dose of ibuprofen I will emerge stronger than I was before. Or at least not sick anymore. Warpcon 2014 – Game three. I’m 2-0 after Round 2 and going into the last round of the day, I’d really like to finish with a perfect spread. I’m drawn against Dan, who has some lovely yellow and blue Cygnar. He’s packing eCaine with a Hunter and ALL the solos, and eHaley with a Stormwall and Ol’ Rowdy. I figure he’s probably going to drop eCaine because of Conquest, but I can’t take Vlad2 because Caine can kill basically all of my Doomreavers on Turn 1, and I really don’t want that, so it’s eSorscha vs eCaine. Warpcon 2014 – Game two. After a solid 5-1 Scenario victory in Round 1, I’m drawn against another Khador player, Killian, who received the Bye in Round 1. He’s got Butcher3 and Karchev, which means Sorscha is getting another run out. I’m not sure Vlad can deal with either list, as there’s a lot of armour in both lists. Warpcon 2014 – Game one. This weekend, Cork was host to the first big Warmachine and Hordes event of the Irish Calender, Warpcon 2014, which is held every year in UCC. 25 players traveled from across Ireland to take part, trekking from as far away as 2 hours on the train. It’s a small country ok? In which Master Siskington escapes his richly-deserved punishment in exchange for of a life of adventure. The discerning reader will realise that I could not write this memoir if I had died that fateful evening garroted on the floor of my bedsit flat above a garlic shop, and this is of course this case. I did lose consciousness however, so what happened next I only have second-hand.